When artists run out of things to make art about—that’s the day I’ll no longer have a job writing about art. The moment of mutually assured destruction came close to fruition last Saturday evening in a collaborative exhibition by Chelsea Culp and Ben Foch. The venue was Vega Estates, literally a garage and a basement serving as temporary sites for art. 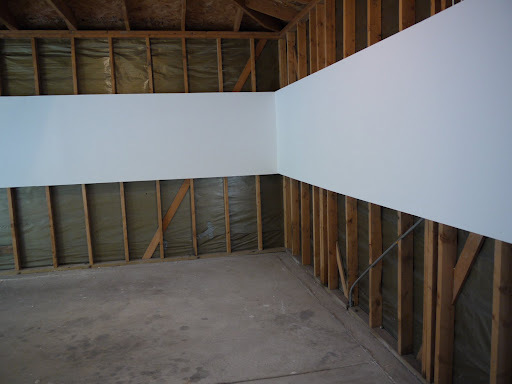 The freestanding two-car garage contained a perfectly flat white wall ringing its interior. Perhaps two or three feet in height, the wall reached neither the floor nor the ceiling, but floated around the perimeter like an elegant Minimal sculpture. The unfinished basement, moldering and dark, featured a museum-quality vitrine, or display case, ominously lit in a corner. The case contained several faux-primitive voodoo doll-like items. At best, the pieces are well-executed copies of well-worn concepts. The re-creation of a white cube gallery, as a critique of the institutionalization of art, translates the classic 1976 book “Inside the White Cube” into three-dimensions—which is sort of backwards, since the book is about white spaces anyway. Here, the white wall is made well. It is clean and flat. The vitrine in the basement, with its mock ritual objects, seems to nod directly to the Museum of Jurassic Technology, in Los Angeles, and “museum interventions” in general, in that it supposedly dissects the artifice of display. The case is a fine replica of a museum case, and constructed quite well. At worst, the two installations are evidence of an identity crisis. They seem to ask, “Where do I belong in the scheme of the art world?” Dear artists, look to your audience, which was in abundant supply at the opening reception. Nobody lingered within the installations; everyone gathered in the artless yard. Vega Estates, which is the venture of several artists, and is open only during the warm months, has a casual vibe. Ice cream and homemade beer are served, and art is the community cause. But the white wall in the garage was installed to barricade the door, proving a barrier for entrance. If the white cube is the problem, then why not create something better given the opportunity?